Google Analytics Content Grouping: Why Are You Not Using It? Content Grouping is a feature that was released by Google Analytics back in December 2013 but I don’t feel enough fanfare has been made about it and its uses. I say this because I find it both incredibly easy to implement and very useful. There’s no tech or dev required. There’s no need to understand regex or figure out complicated filters. There’s no super excel powers needed to be able to gain actionable insight from this simple addition to the Google Analytics interface. Having said that, all of those things can be used in conjunction with content grouping to automate and improve the process if you so wish. Even beginner users are able to set up the basics of Content Grouping and get benefit out it. I won’t go into the details of the specifics the various ways to set it up. This has been covered very comprehensively by Justin Cutroni over on his blog. Justin explains exactly what the benefits are of the various methods of implementation in detail, so go read it! I’ll focus more on background and uses. So what is Content Grouping? It’s a very simple feature that allows you to do just that, group the pages of your site according to the content they represent. This is particularly useful on very large sites or sites that have a large variety of different types of content. Imagine you are an up-and-coming ethical goods e-retailer. You cover everything from environmentally friendly washing up liquid to complete water saving household systems. You write blog posts about different eco lifestyle products and connect the dots across your site for users (and search engines). How do you categorise all of these different types of content and products to be able to easily dissect and gain valuable insight? You can use advanced segments. Content grouping is in many respects a simplified version of advanced segments. You decide what you want to segment and how. The key difference is that ‘segment’ is then added to your dimensions. This means you can then use it in any of your custom reports, in the same way that you would use any other dimension. Where do you find Content Grouping? There’s two ways. The first and simple way is to be aware that it is now available as a dimension at the top of your site content ‘dashboard’, and looks a little like the below. Apologies for the greyed out numbers. The second way to find your content grouping is to just USE it. 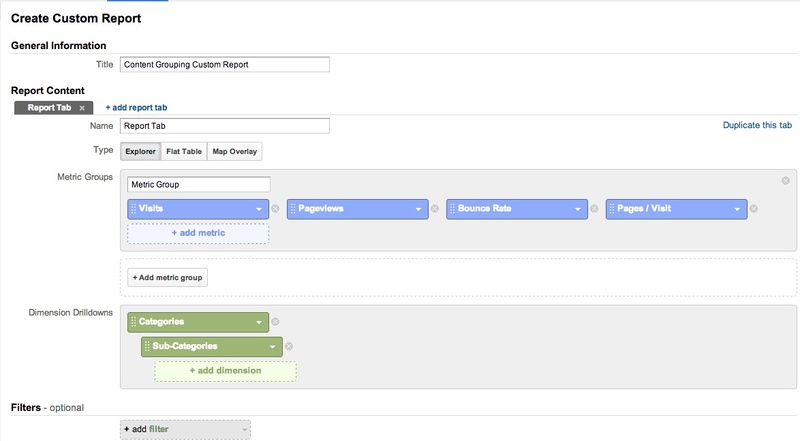 Remember once set up, they are added to your dimension options so can be used when creating any report. Custom reports rule for this. You can see an example below where I’ve just set up some basic metrics, looking specifically at my content groups (which I’ve simply labelled Categories and Sub-Categories). This is for a site with little to no categorisation structure so content grouping allows me to see trends my standard GA dashboards can’t. So how to implement Content Grouping? Essentially there are 3 implementation options. And the crucial point is they can each be used individually or in conjunction with one another – which leaves excellent opportunity for updates and improvements. Each implementation method is applied in sequence, starting with Option 1 through to Option 3. The second most ‘automated’ version of the code, this does require some knowledge of regular expressions to be able to effectively use it. Essentially you are defining which content should be grouping and how based on defined rules around URLs or page titles. This is the most time consuming process as it requires you to manually define your set of rules in order to be able to appropriately group your content. However for the less techy folk out there, this does mean that any content editor or marketing exec can actually get down into the nitty gritty of analytics fairly easily. All you need to do is define what content goes where. You can find your content grouping editing options within the Admin menu, just under your Goals. After a few quick set up stages, you’ll quickly be able to use these new ‘segments’ as part of your everyday reporting – gaining improved insight into content trends and impact. You are limited to FIVE content groups, but there are no limits to rules within each of those groupings. A given page can only be included in a single content grouping at any one time. If you see (not set), this means the item does not fit into any of the rules you have set for that group. As the rules cannot be applied historically, it can also simply mean that the rule did not yet exist for the date range you’re looking at. As you cannot apply your rules historically, be aware that once your groupings are set – they are set. Plan out what content groups you are looking at and why before you start playing with them in GA. I think that’s it. There’s is literally NOBODY who would find this too advanced, so go forth and get to know your site’s content a little better.